The U.S. debut of a 4K restoration of Alain Resnais&apos;s debut feature Hiroshima Mon Amour will screen at the 2014 New York Film Festival. Considered an early important work of the French New Wave, the film will be a spotlight in NYFF&apos;s Revivals section—in its first theatrical showing in decades—prior to opening at the Film Society on October 17. 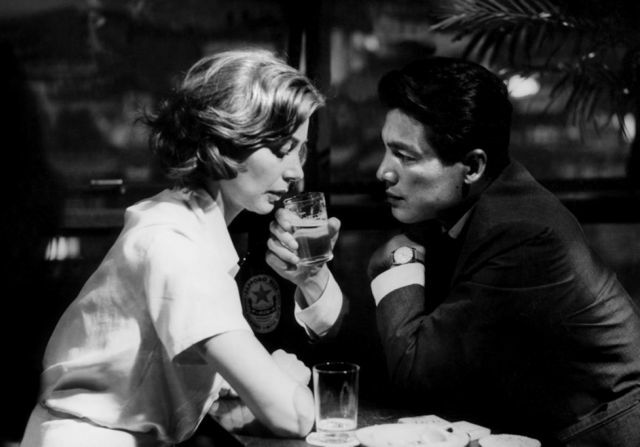 Filmed in 1959, Hiroshima Mon Amour had its roots as a documentary commissioned by Japan&apos;s Daiei Studios. Producer Anatole Dauman secured the project for Resnais who added a fictional thread to the bombing of Hiroshima, near the end of World War II. The story revolves around a French film actress, played by Emmanuelle Riva, who goes to the Japanese city to make an anti-war film and has an affair with a Japanese architect (Eiji Okada). Nominated for a screenplay Oscar in 1961, the film was heralded as one of the most influential movies made at the time. It was also awarded the International Critics&apos; prize at the 1959 Cannes Film Festival. Its strident anti-nuclear stance, however, kept the feature out of the festival&apos;s main competition in order to avoid offending the U.S. Despite being monumental work of the New Wave, the film has long been unavailable for exhibition in the United States due to rights issues. It has even been absent from various Resnais retrospectives in recent years. NYFF’s Revivals section celebrates and revisits classic and important films by filmmakers, auteurs, producers, and studios that helped shape world cinema. Previously announced were Howard Brookner’s Burroughs: The Movie (1983), Sergei Parajanov’s The Color of Pomegranates (1968), and Sergio Leone’s Once Upon a Time in America (1984). “Hiroshima Mon Amour is one of the most influential films in the short history of the medium. It&apos;s difficult to quantify the breadth of its impact,” noted Kent Jones, Director of the New York Film Festival. The restored Hiroshima Mon Amour will be released by Rialto Pictures.